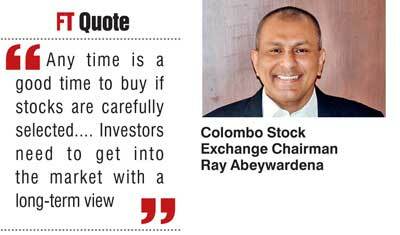 Expressing optimism over investing in the capital market, newly-appointed Colombo Stock Exchange (CSE) Chairman Ray Abeywardena yesterday said the support of all stakeholders was key to ensuring rapid yet sustainable capital market development in the country. “Globally a stock market is the barometer of the vibrancy of the country’s economy. We need to develop the Colombo Bourse the same way for which due recognition of and cooperation from all stakeholders is necessary. This could be achieved via a high level committee comprising all stakeholders,” said Abeywardena. The first career broker to rise to the helm of the CSE, Abeywardena, who counts over 30 years’ experience in the capital markets industry, said that his immediate focus was to further enhance daily turnover levels, liquidity and the number of listings. For the latter he said the onus is on both the Government and the private sector whilst the CSE will endeavour to improve the ease of listings. The CSE will also work towards expediting the introduction of the Delivery Versus Payment (DVP) system, which is one of the key measures to further enhance investor confidence whilst in parallel finalise measures towards setting up the Central Counter Party (CCP) clearing house mechanism as opposed to current Trade + 3, the other important element in capital market development. DVP will enable the CSE to facilitate the introduction of short selling and stock lending thereby making investments in listed equities more attractive as well as boost turnover. Conversely, CCP will help trading of derivatives, a popular investment option. Market-centric initiatives such as higher listings which boost market capitalisation as well as new products are key to increasing turnover. At present the CSE’s daily turnover amounts to around $ 6 million (this year), significantly lower than Bangladesh’ $ 100 million, Malaysia’s $ 230 million and Singapore’s $ 800 million. Given the welcome revival of the Colombo Bourse in recent months, with net foreign inflows hitting a record high of Rs. 18 billion year to date and indices turning positive after two years of negative returns, Abeywardena emphasised there was a lot of potential for the stock market going forward. “Earnings have been encouraging which further enhances the valuations,” said Abeywardena, who is also the Managing Director of Acuity Partners Ltd. Pointing out that “any time is a good time to buy if stocks are carefully selected”, the new CSE Chairman said people, especially retailers, need to study the market properly using research rather than opting for speculation. “Investors need to get into the market with a long-term view to enjoy better returns than fixed income options,” he emphasised.